Are you a KUB customer? Get informed about your raising electric bill! Knoxville Utilities Board (KUB) is hitting their customers hard with some of the highest fixed fees of a municipal utility in the TVA service territory. KUB approved a $1.50 basic customer charge (a.k.a fixed fee) increase each year from 2017-2019. The most recent October increase should now be visible on your November bill. Raising mandatory fixed fees increases the power bills for thousands of families who are already overburdened by utility costs. That means we pay $19 a month before even flipping a switch! Unless we continue to stand up and fight back together, that fee will climb to nearly $30 a month by 2027. KUB’s ten year plan proposes fixed fee increases between $1-$1.25 every year. Without KUB customers speaking out, the board may approve another three years worth of increases. High fixed fees mean we have higher bills, and less control over our bills despite our efforts to conserve electricity. Electric bills in TN are some of the highest in the nation, and too many KUB customers pay as much as 18.5% of their income on energy bills. The last thing we need is higher fees. Even though the KUB Board continues to raise the fees, I can tell that they are starting to take notice of our actions. At the last board meeting on November 15th, a KUB executive presented that the average electric bill has been fairly consistent since 2011, despite the percentage of the fixed fee increasing 300% over the same time period. This huge increase of fixed fees de-incentives KUB customers to be energy efficient since they won’t see a difference in their bills. To make KUB a true leader in our state, they would encourage energy efficiency and clean energy use, not discourage it. Our environment and our children and grandchildren’s future depends on it. If you haven’t already, send an email to Gabe Bolas, KUB’s new CEO. Take our action here. The next KUB Board meeting is December 20th, 2018, at 12pm in downtown Knoxville at 445 S. Gay Street. 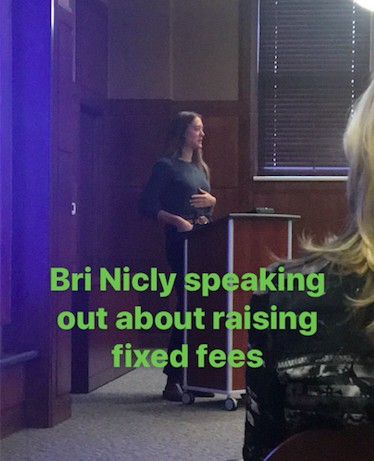 Simply coming to speak about how high fees hurt your household. Email Laura lhumphrey@cleanenergy.org if you can attend. Call KUB and ask them to stop raising the basic customer charge and to repeal the decision to raise the current fees. Take action here! Want to learn more about how you can get involved? Email Laura Humphrey, lhumphrey@cleanenergy.org. If KUB continues to ignore the request of their customers, we will continue to have actions to fight back. We’ll need your help, so stay tuned!